The Center of Anthropometric (Orthopedic) Cosmetology and Correction provides a unique opportunity to correct a deformity of the frontal part of the foot and toes – Hallux valgus (transverse flat foot, transverse platypodia or so-called Bunion Deformity, “feet bumps”, “osselets”. 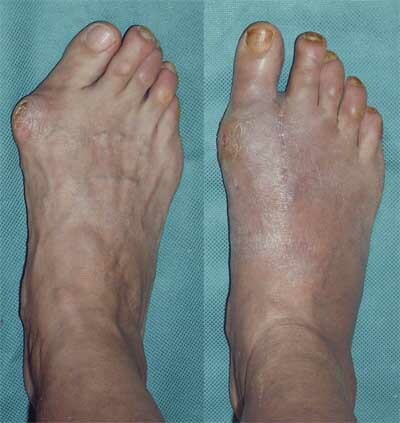 Hallux valgus (Bunion Deformity) is the most common orthopedic condition which occurs more frequently in women. The cause of this deformity is not definitely clear, but hereditary factors are obvious. In the initial stage, there is a misbalance between the foot ligaments, tendons and muscles; later, changes in bones and joints develop. Deformity of the foot becomes evident and in slow progress. In the end the deformity becomes permanent, transverse platypodia develops, the angle of deviation of the big toe increases, and a bump shows up in the area of the first metatarsophalangeal articulation. The big toe presses the neighboring toe, the latter gets bended and takes a wrong position (a hammer-like toe). This is a typical pattern for Hallux valgus. Transverse platypodia may be accompanied by pains in the foot while walking, which is usually due to inflammation of soft tissues, formation of callosities, blisters and other conditions. Nowadays many methods of surgical treatment of Hallux valgus are used. Usually these methods consist in intersecting the bones, placing them in the correct position and fixing them with metal devices (plates, screws, needles, wire etc.). Their removal is often not less traumatic than the operation itself. Application of conventional techniques implies putting the foot in a plaster cast for 1.5-2 months and walking with crutches for 3-4 weeks. Besides, there is a risk of recurrent deformity in 30-40 per cent of cases. The Center of Anthropometric (Orthopedic) Cosmetology and Correction has a long experience in surgical treatment of deformities of the feet. Our method is the least traumatic and needs the shortest possible time of treatment (the method is patented). In a single stage, the complex deformity of the frontal division of the foot is eliminated and the normal form is restored without intersection of the bones, therefore no plaster cast or a long-term rehabilitation period are required. The patient says in hospital for 1-2 days (14 days for international patients); after stitches have been removed, load on the feet may be slowly increased and longer walks are recommended. The normal function of the operated foot is usually restored in 1-2 weeks. In most cases, the surgery is performed under local anesthesia. Till now, we have operated on more than 400 patients. In all cases a good cosmetic and functional result was achieved. If you suffer from hallux valgus we invite you to our clinic in Volgograd, Russia, to safely remove your problem. To get more information contact us via email: hallux@rucosm.com.